They can be sweet to one another, though, and I’m grateful for that. Although I can’t think of a story right now that illustrates this, just trust me, there are hugs and kisses given throughout the day. Jolie surprised us over the weekend by sleeping 12 hours straight on Friday AND Saturday night. We were new people those days, Isaac and I: productive, happy, patient. And Jolie napped better during the day – go figure! I was beginning to think that her limit was 10 hours, and that was that, but now I’ve been given a ray of hope that will shine on me for a long, long time. Sophia always had her best blanky to keep her company during “night-night” time, and we were beginning to wonder if Jolie would ever be attached to anything… but it turns out she is in love with a pink kitty that Pop-pop bought for Sophia when he came to Alaska to do my brother’s funeral. This may very well be why she likes to go down to sleep better now, because she likes to make kitty “go nigh-nigh”. It’s very cute. Meanwhile, in the placental world, baby #3 is moving around like crazy and is now 29 weeks old. 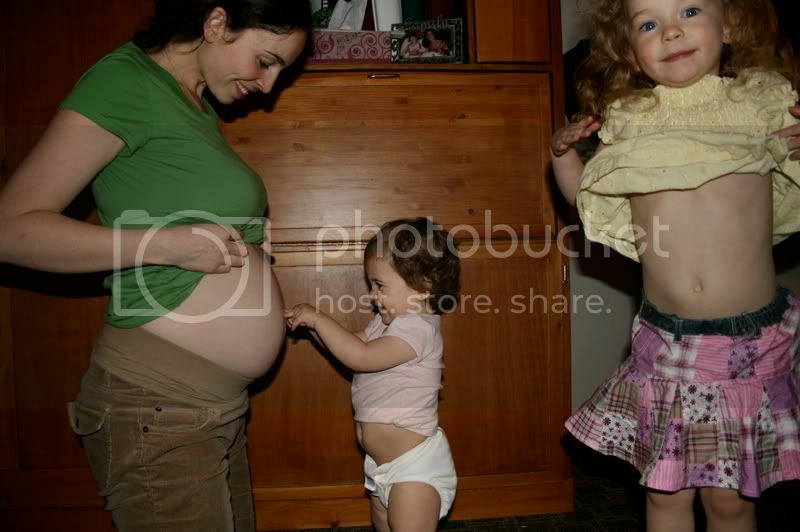 Jolie will point to my tummy when I ask her where Mama’s baby is, and Sophia asks all the time if she can see the baby “for real” (as opposed to the disappointment she experienced when she saw the ultrasound). Sophia told me the other day that she actually has a baby growing inside of her, too, believe it or not. It moves around a lot and prevents her from being able to pick up stuff off of the floor (“It hurts me to bend over with this baby in my tummy! ), and it also makes her very tired. She also told me that Jolie has one, too, which means we’ll have quite a large family when all of these babies are born! I'm married to the best-looking, most considerate, funniest man alive. We have four beautiful, curly-headed children - 3 girls and a boy (all in under 6 years! ), and we live in one of the most gorgeous places on earth. I'm happy to get the chance to give friends and family a glimpse into our lives as we strive to love each other better every day.